Who would have thought a little piece of latex and an old orange jumpsuit would cause a controversy? Well, Target certainly didn’t, but here they are issuing apologies and removing things from their store thanks to the Illegal Alien costume. 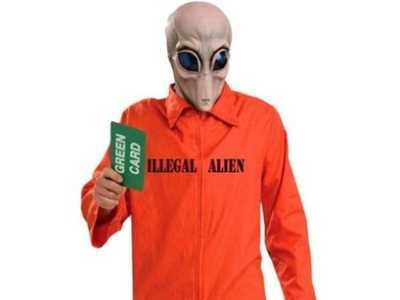 It’s a space alien mask, prisoner jumpsuit, and a big green card that says “Green Card” on it. I imagine that’s the kicker that made immigrant rights groups lose their minds. It makes me wonder. Are people getting more sensitive these days? When I looked through the costume shop of some other online retailers, including Target competitors who still stocked the Illegal Alien outfit, I saw a bunch of other things that could be offensive. Like, say, a Mexican Bandit costume with giant mustache. Ninjas and samurai and sumo wrestlers. Lots of “white trash” and “hillbilly” costumes. Hobos of various sizes and shapes. An army of pimps, cross-dressers, and leprechauns. And lots and lots of fat people costumes. Do some of them offend me? Yeah, but I can also laugh at them, even when they’re poking fun at various racial, socio-economic, and ethnic identifiers that I could be lumped under. You know why? Because if someone had hate in their heart for that particular group of people, they’d never wear that costume. It’s that simple. Plus, a world of nothing but super hero costumes is boring.